Figure 8 The dependence of nitrogen (a) and phosphorus (b) load reductions on CWs to catchment ratio. Adapted from Koskiaho J and Puustinen M (2005) Function and potential of constructed wetlands for the control of N and P transport from agriculture and peat production in boreal climate. 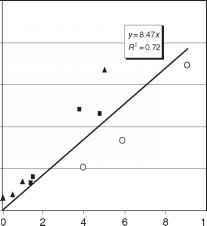 Journal of Environmental Science and Health A 40(6-7): 1265-1279. A geographic information systems (GIS) based multi level suitability assessment scheme can be used in the estimation of landscape potential for the establishment of wastewater treatment CWs in rural areas. It consists of landscape classification according to the physical-chemical properties of landscape factors (such as soil conditions, landforms, and hydrogeology), expert deci sions concerning landscape values, and suitability analysis. The partial suitability values of FWS CWs are derived by summarizing expert values for land scape factors (each ranging from —1 to +1). The final suitability value for each landscape type has been obtained by multiplying the summarized partial suitability values with nature protection values (ranging from 0 to 1). 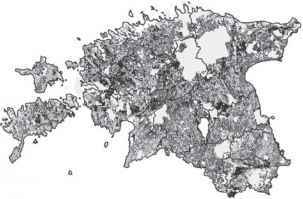 Based on these suitability analyses, it has been demonstrated that in Estonia the share of 'very sui table' areas for the construction of FWS CWs is 16% and the share of 'suitable' areas is 25% of the entire country (Figure 10). Thus Estonia has a high poten tial for the use of wetlands for watershed management. 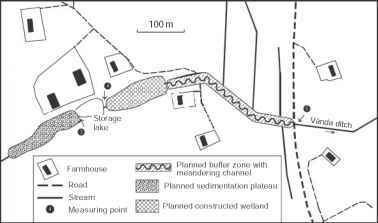 Figure 9 The location of planned ecological engineering measures for nutrient outflow reduction in the Vianda catchment. Enlarged from Figure 5. Adapted from Kuusemets V and Mander Ü (2002) Nutrient flows and management of a small watershed. Landscape Ecology. 17(S.1): 59-68. Figure 10 Suitability for FWS CWs in Estonia. Black - very suitable, dark gray - suitable, gray - neutral, light gray -unsuitable. Adapted from Lesta M, Mauring T, and Mander Ü (2007) Estimation of landscape potential for construction of surface-flow wetlands for wastewater treatment in Estonia. Environment Management 40: 303-313.